Do you have a penchant and love for all things Plants vs. Zombies? If you have answered in the affirmative, then you might be interested to check out the $24.99 Plants vs. Zombies Yahtzee. This is no ordinary yahtzee as you can tell by its name alone, as it will be accompanied by half a dozen custom dice to get you started, not to mention boast of a collectible Conehead Zombie dice shaker, now how about that? No true blue Plants vs. Zombies fans would want to let this opportunity pass by them for sure. 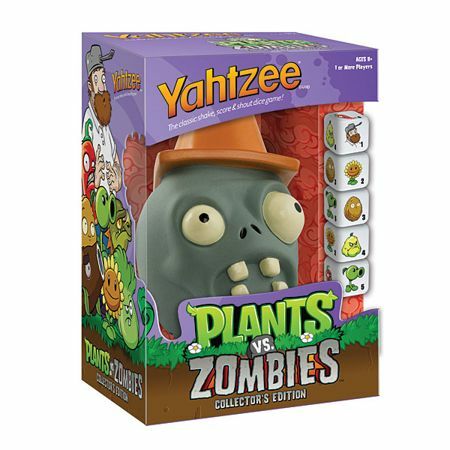 The Plants vs. Zombies Yahtzee is the only yahtzee available that you know from years of playing the game, where it will now arrive spruced up with 100% more Plants vs. Zombies. Everything just oozes with pure fun, ranging from the Conehead Zombie dice cup to the deco on the dice themselves, it is definitely a fun take on the classic game. Imagine rolling five Crazy Daves just so that you are able to yell your lungs out with the word, “Yahtzee!” Needless to say, you might want to play Plants vs. Zombies Yahtzee whenever you tell, otherwise it might be the straightjacket for you as folks figure out that they have found someone who has out-crazied Dave!